This painting, created about a year, was revisited the other day. 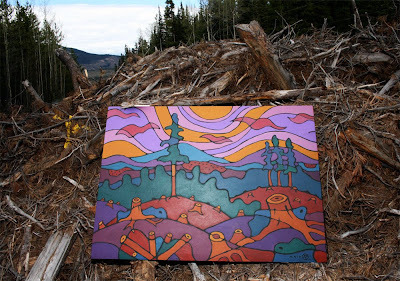 I am preparing for a show at the Museum of Northern BC that will feature my fire paintings. This painting, which was originally not a fire painting, I decided I would "toast" a little so that it would fit in with the show. I had forgotten that beneath the top layer of canvas on this painting, there was an old painting beneath! What a surprise when the vibrant red poked through a blackened hole. The result is of an almost visceral quality-- the feeling of something intimate revealed beneath a burned away facade. 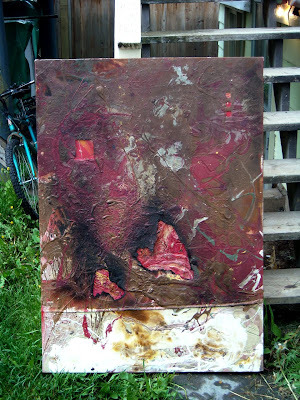 This is a new photo of an old painting. It was taken for a slide for a project proposal. Rather than a boring gallery photo of the painting, I thought I would give it some of its original context. A photographer friend and I (Ryan the link to your site would go here!) went out in search of clearcuts, and managed to find this beaut of a slash pile. Its been a long winter. 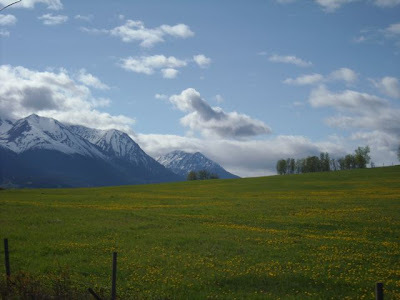 At last the green greatness of Spring is prevailing over the dreary grey remnants of a long Bulkley Valley Winter. Two years ago, inspired by a good book, I asked myself a fateful question: What do I fear? The list, short at first, grew long. A burst of courage inspired me to challenge those fears. One of them, near the top, was Death and Aging. An off shoot of this fear I observed to be manifest in my circle of friends and acquaintances-- they were mainly my age. I had very little contact with anyone over 60 or 70 years old. In a small community, this is a notable social generation oversight, that surely said many things not just of me, but of my culture. I decided to tackle this fear head on. I came up with a devious scheme. Why not do an art installation in the local seniors care centre? One phone call lead to another, alot of political and social engineering ensued by myself and others, and I now find myself now on the third phase of a major project. Beautiful things happen when one tackles one's fears head on. There is a fantastic three panel cartoon I remember seeing that illustrates the process of confronting fear. First frame: Man running away from giant sized monster. Second frame: Man turning to look at slightly smaller monster. Third frame: Man walking towards shrunk mini-monster with foot poised to easily step upon. I can now imagine the fourth frame: Little daisy rising from spot of squished monster. This simple entry was made while cycling through Houston BC, on my new iPod Touch, a little gizmo that you can put in your pocket. I remember, back in the day, when making a webpage involved multiple programs, servers, and FTP clients. Now, it can be done wirelessly with a device the size of a deck of cards, while cycling through a strange town using only one's thumb to touch buttons on a screen. My current artistic endeavour: The third of four murals at the BV Lodge Seniors Home in Smithers. A new painting. 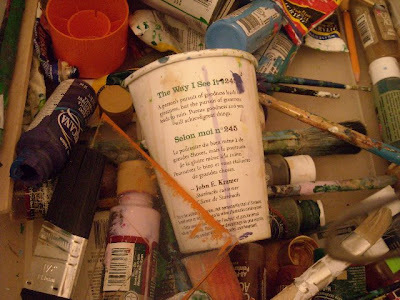 It is composed of nine paint leads that I have used as incidental pallettes over a period of three years. Each lid had developed its own character. I couldn't resist putting them together. Here is a recent creation for Humanity's Team Canada. 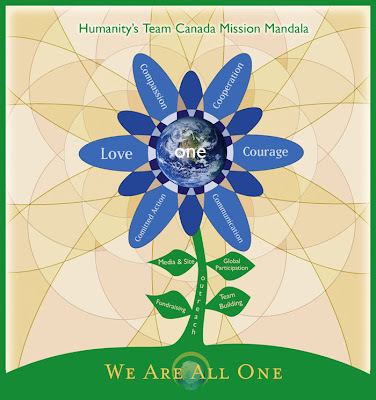 This image uses a mandala flower to illustrate the core values of the movement. It strikes me that mandala patterns are particularily well suited for illustrating the focused intensions found in mission and vision statements. One can almost imagine how ideas, thoughts and feelings are continuously crystalizing outward from us in a ripple like pattern through time. In this way, its as if we all have mandala like fields of patterned thoughts emanating out from us in all directions. This would be true of of organizations and groups of people also. By placing the values and priorities of an organization's intention in a circular it is a reminder and illustration of this principle. I feel, that having the mandala around the flower is thus quite appropriate. It represents not only the growth and flowering of the group's movement, but the the beautiful emanations that it is creating all around it. Mandalas are an ancient spiritual art form found in almost every religious traditions. Mandalas use circular geometry to create powerful consciousness raising art. 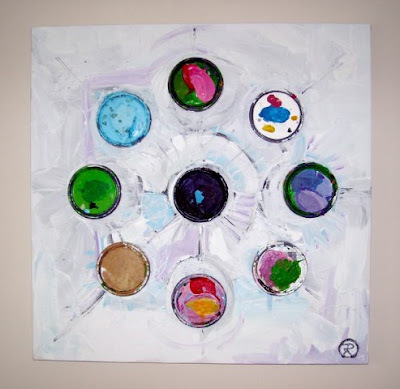 Our Oneness Mandala will be a powerful statement of our interconnectedness. You are invited to submit your self-portrait! 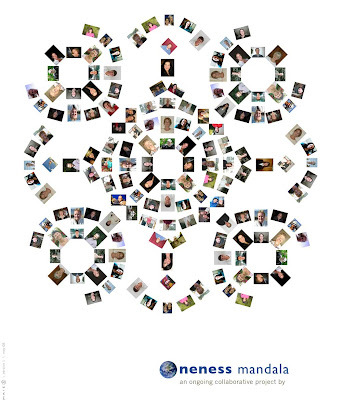 See www.1Mandala.org for guidelines and for more. The project is now translated into seven languages. As I prepare to move on from my community here in Smithers of the last four years, I have baptized my last days here with the theme of 'harmonious completion'. Rather than being "crazy busy" or "preoccupied" it is a much more satisfying and positive theme to work with. The difference is palpable as my completions progress. I once read that in the moments of our lives of major change, there is much energy in the air and if we are conscious of it, we make much of it. I am in such a moment, and, there is indeed much energy in the air! A remarkable series of sycronicities are moving me forward in the wrapping up of my commitments and the beginnings of my new chapter. While working on a mural in town last year, I bought myself a starbucks coffee. An unlikely source of profundity, the cup's quotation, resonated with me. 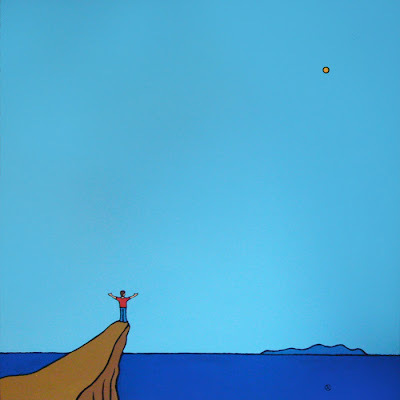 As an artist achieving "greatness" is a constant query by stereotype of this particular path. It is also a severe distraction in times such as these of being in the moment and doing things well and Good. I recently photographed the mug. It serve as a paint brush and water holder-- not to mention a reminder-- for sometime. Although it is fast approaching its end of those first uses, this photograph will extend its latter service. "A person's pursuit of goodness leads to greatness, but the pursuit of greatness leads to ruin. Pursue goodness and you will acheive great things"
As I wrap things up, I seeing just how much better it is having things done things well, and good, rather than 'greatly'. Greatness is incidental. Goodness is essential.